On September 21, 2013 in Paktia Province, Afghanistan, while supporting a training exercise for a group of Afghan National soldiers, SGT Strickland’s unit came under fire in an insider attack. One of the Afghan National trainees turned his gun on Strickland’s unit, before being shot and killed by the Afghan commander. Joshua died of multiple gunshot wounds; also killed in the incident were SSG Liam Nevins and SSG Timothy McGill. Joshua was born on April 5th, 1990, along with his twin brother, Andrew, in Sacramento, California. Not long after the twins were born, they moved to New York before settling in Texas where they spent most of their childhood. Growing up, Joshua was a natural athlete, quickly adapting to every sport he played, loved music and playing his guitar. In whatever endeavors Joshua pursued, he was easily recognizable by his perpetual grin and hard-working attitude. “He had a smile that would light up a room. He loved kids, loved people. We know he’s in a better place now, probably laughing at all of us. He was just a great kid,” SGT Strickland’s stepfather, Jim Funk, said. After graduating high school, Joshua enlisted in the Army, and shortly after completing basic training, he joined the Special Forces Support Group as a heavy diesel equipment mechanic. From an early age, he showed a patriotic sense of duty, and loved having the opportunity to serve his country. He took easily to his job in the Army, and planned to make a career in the military. In 2010 Jay, as he was affectionately called by family and friends, met his wife, Heather. After only 3 months, they knew they were meant to be together and decided to make it official by getting married. They immediately began building their life together as he became a step-father to her two children that he loved as his own, and in 2011 they welcomed a daughter, Victoria, into the world. Jay lived his life full of passion and laughter, never missing an opportunity to show his family the love he felt for them. Although he only had a short 23-year-long life, Jay left a lasting impact on all those who were fortunate enough to meet him. SGT Joshua Strickland was 23 years old from Fort Worth, Texas. 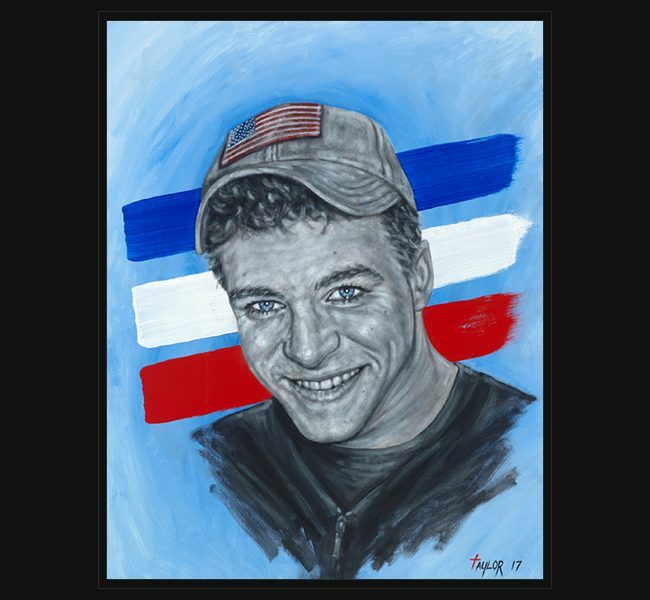 Original portrait was delivered December 10th to his wife, Heather, brother, Andrew, parents and family at an intimate presentation hosted at The National Gallery in Addison, Texas.